The a7 III announcement sent waves across the camera marketplace and as I complete this review, many weeks after the camera first hit the streets, it remains out of stock at all major retailers. Sony has been aggressively pursuing marketshare, using their excellent imaging sensors, highlighted by excellent dynamic range and low noise properties, and their outstanding feature lists to win photographers over. The a7 III is an entry level full frame mirrorless interchangeable lens camera (MILC) that only seems entry level because of its low price. The 24 MP imaging sensor does not give the a7 III claim to being close to the highest resolution full frame camera available, but this is still a significant resolution, one very adequate for many purposes. And, this imaging sensor has the mentioned high dynamic range and low noise qualities. The a7 III's very impressive feature list will help it win most comparisons, so there is not much lacking here and the a7 III appears to be a bargain at this price point. Fortunately, overall, these references are rather mild. What are the Differences Between Sony a7 III and Sony a7R III? I usually save camera comparisons until the end of a camera review, but these two camera model names differ only by the letter "R". As I will be frequently referencing the a7R III, the prior Sony camera I evaluated and the model I currently own, throughout this review, an up-front look at the differences seems logical. The most significant differences for most photographers reside at the top and bottom of this list. The difference between 24.2MP and 42.4 is very significant and so is the price gap between the two cameras. Image quality is of course a primary consideration for camera selection. 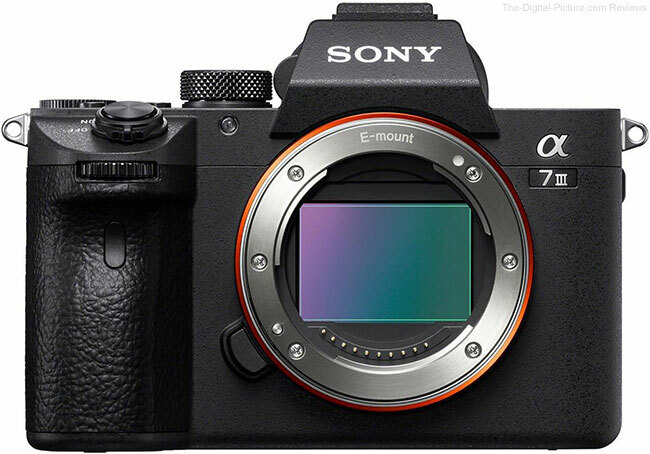 To that end, the Sony a7 III receives a modified version of the full-frame 24 MP stacked CMOS sensor which originally debuted in the action-oriented a9. The a7 III yields an only mid-level pixel density relative to the other currently available full frame format models. Here is a resolution comparison between the Sony a7 III and the a7R III. Notice the moiré showing in the a7 III these results. Lower pixel density means lower resolution, but there are advantages to lower resolution sensors with lower noise levels and lower price being two of my favorites. The benefits of the large amount of light captured by the full frame sensor format is huge and many will find 24.2 MP of resolution more than adequate, especially considering the quality of those megapixels. High on my list of a7 III tests was to look at the image quality and the site's standard noise test is always illuminating in that regard. With the Sony a7 III noise test results, much can be discerned. 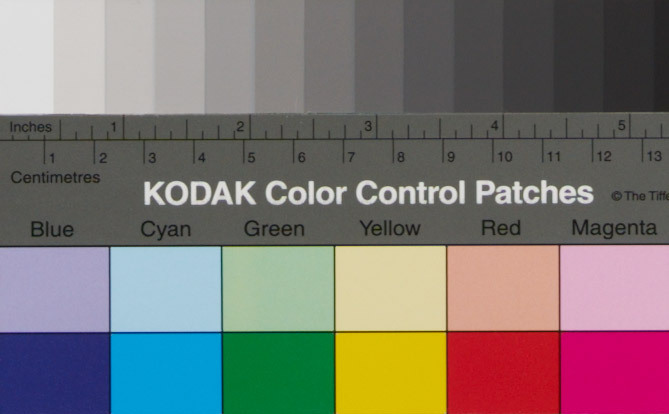 The smoothly-colored Kodak color patches test chart combined with no noise reduction processing (key point) makes noise especially noticeable compared to detailed scenes that better-hide noise levels. As always, noise reduction processing can improve upon the noise level seen in these images, but noise reduction can be applied to images from every camera, reducing its differentiation. So, avoiding noise reduction in the comparison levels the playing field. The Sony RAW-captured noise test images utilized the "Uncompressed" RAW setting and were processed in Capture One with the Natural Clarity Method and the Sharpening Amount set to 30. With a sensor identical in size and resolution as the a9's, it would be reasonable to assume that the a7 III would produce similar (if not identical) image quality when compared to Sony's sports-oriented camera. In this case, the ISO tests confirm that expectation. From ISO 100 through ISO 800, noise levels grow, but they remain very low, showing the benefit of a modern, modestly-high resolution full frame sensor. At ISO 1600 through ISO 3200, noise levels are noticeable, but images still retain very high quality and few will hesitate to use these settings. ISO 6400 images begin to take an impact from noise and at ISO 12800, images are looking a little rough. Consider using ISOs of 25600 and 51200 only as a last resort. ISO 102400 and 204800 are available and while they sound amazing, if your only option is to use these settings, just pack up and go home. The signal-to-noise ratio is extremely low at these required-for-marketing-purposes settings. Noise reduction is available during post processing of RAW images or in-camera during JPG capture. Two sets of with-noise-reduction results are included in the noise tool for the a7 III, showing the performance at low and normal settings. The default Standard Creative Style was utilized for these results and a set of non-noise-reduced JPG images are included for a base comparison. The first takeaway here is that Sony is applying too much sharpening by default (see the halos?). Also illustrated is that even the JPG image being created with noise reduction turned off appears to have some noise reduction applied. Noise reduction can make a huge difference in the results, but not all of it is positive. Noise reduction is destructive to fine details and must be applied carefully for optimal results. The same applies to sharpening and a stronger amount of sharpening may be needed when noise reduction strength is increased, which then bodes well for Sony's default over-sharpening. Sony promises up to 15-stops of dynamic range at low ISO sensitivity for stills in the press release and Sony MILCs have been highly regarded for their dynamic range. One way to look at a camera's DR capabilities is to over or under-expose images and adjust them to the correct brightness in post processing. The "Exposed +/-" results were captured between one and three stops brighter or darker than the standard results, then adjusted to the standard brightness in Capture One. These results combine to show how noise levels are influenced by the described processing adjustment and they also show dynamic range issues. How do the Sony a7 III noise levels compare to the Sony a7R III? In the Sony a7 III and a7R III noise comparison, we see the a7 III showing less noise, at least in part capitalizing on its large pixels and lower resolution. At the same time, we see that the Sony a7 III and a7R III have very similar dynamic range. That link shows a comparison of images captured at a 3 stop higher exposure setting than the standard results and processed to -3 stops. Notice that both cameras are holding the highlight color similarly in the top-left two monochrome blocks and in the other bright-colored blocks. It is similarly interesting to look at underexposed images with brightness increased by the offsetting amount. In the -3 EV comparison, the a7 III turns in noticeably lower noise levels than the a7R III. The difference remains noticeable at -2 EV with the results becoming more similar at -1 EV. If I underexpose an image by even 2 stops, I feel that I failed in my job. But, it is very nice to know that underexposing when using the a7 III involves little or no noise penalty vs. selecting a higher ISO setting in the first place. Still, getting the exposure right in the first place delivers a lower noise image. And, for high dynamic range scenes, a single image may serve adequately for HDR processing. Increase the exposure by 3 stops and pull it back by the same in Capture One to get an idea of the dynamic range available. In this comparison, the a7 III may have a slight edge over the a7R III, but it is only slight at most. Images from both cameras have lost the color information in the brightest color blocks with the colors becoming gray. Both cameras are looking very good with this chart overexposed by two stops. A real advantage of this capability is that shadow details can be pulled out of a scene that is properly exposed and/or has a very high dynamic range. How do the Sony a7 III noise levels compare to the Canon EOS 6D Mark II? The EOS 6D Mark II is, at review time, Canon's most-similar comparable camera, so it is interesting to look at this comparison. In the Sony a7 III and Canon EOS 6D Mark II noise comparison, we see the a7 III showing slightly less resolution, modestly less noise and slightly lower sharpness. We also see the Sony a7 III having noticeably better dynamic range. While it does not have the highest resolution imaging sensor available in full frame cameras, the a7 III does have remarkable image quality for the price. The a7 III consistently produces great looking images. Camera shake directly impacts image quality for both still images and movies and Sony's 5-axis Optical In-Body Image Stabilization (IBIS) is a difference-maker. 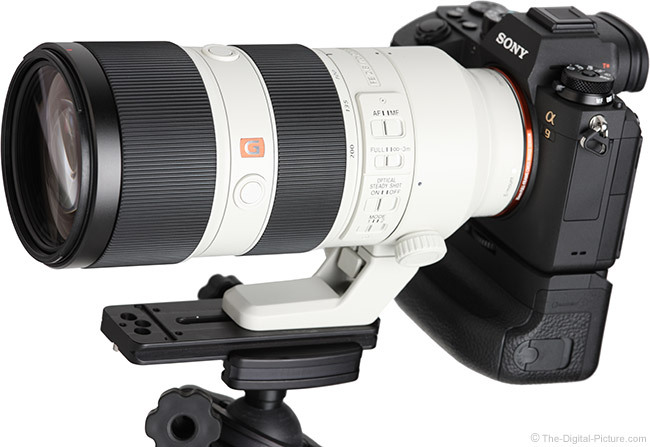 Many of Sony's lenses, including the Sony FE 70-200mm f/2.8 GM OSS Lens have image stabilization included and in-lens stabilization can be better-tuned to the focal length being used, but not all lenses have this feature. Lenses like the Sony FE 16-35mm f/2.8 GM Lens have greater versatility with IBIS available and this camera has that. Also, IBIS can work in conjunction with OSS (in-lens Optical Steady Shot) for an enhanced overall performance. Sony offers the "Compressed" and "Uncompressed" 14-bit RAW file format options. Because of the TIFF-like file structure (RAW converters create 16-bit TIFF files from Sony RAW files extremely quickly), Sony RAW files remain consistently-sized throughout the ISO range. Regardless of the ISO setting used, the a7 III uncompressed RAW files weigh in at about 47.3 MB. The compressed a7 III RAWs are about half as big, each being about 23.8 MB. Is the difference between Sony compressed RAW and uncompressed RAW noticeable? In real life images, I have difficulty seeing any difference even when zooming to magnifications much greater than 100%. But, I'm very particular about image quality and my Sony cameras are always set to capture uncompressed RAW images. And, I pay a significant storage penalty for this strategy. A great feature for any camera, but especially one at this price point, is dual media slots. The a7 III can write files to both cards simultaneously (for redundancy) or sequentially (for increased capacity) with especially the former being valued by professionals who can afford no excuses. I was a bit surprised to see the now-somewhat-old-standard SD/SDHC/SDXC memory cards and also Memory Stick Pro Duo cards being the only options supported by the performance-driven previously-released Sony a9. It was less surprising when the a7R III adopted the same and it was expected that the less-expensive a7 III would duplicate this design. Memory card slot 2 supports the UHS-I SD standard while slot 1 extends compatibility to the faster UHS-II format. While I question why both slots are not UHS-II-capable, I like that I can use the same card format in both slots. Only slot 2 supports the Memory Stick Pro Duo standard (and this perhaps answers the question I just asked). While faster card formats are available, I like the convenience of being able to use the SD card reader built into my Dell XPS 13 laptop and that I have plenty of SDXC cards is similarly convenient. A dramatic feature upgrade received by the a7 III is the 10 fps high speed drive rate, doubling what its predecessor, the a7 II, was capable of. Going from 5 fps to 10 fps is significant and shifts this camera well into sports and fast action speed range, and the a7 III's 40 RAW frame buffer depth will translate to a high percentage of peak action shots being captured. 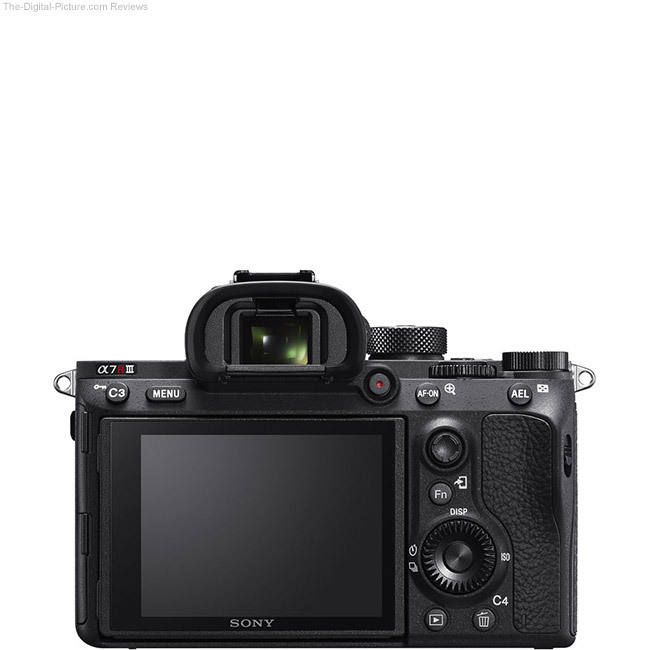 View the full Sony a7 III specifications to compare additional cameras. With a freshly-formatted fast Lexar 128GB Professional 1000x UHS-II SDXC U3 Memory Card loaded and the Sony a7 III set to "HI+" continuous drive mode, ISO 100, a 1/8000 shutter speed, a wide open aperture and in both MF and AF-C modes (1/800 shutter in this mode), 34 uncompressed raw images are captured in 3.37 seconds for a 9.8 fps rate calculation. Additional frames are then captured each .75 seconds, indicating that the a7 III takes about that long to write an uncompressed file to the card. Switch to compressed raw format and the buffer depth increases to about 84. In "HI" (vs. "HI+") drive mode, the buffer filled with 35 uncompressed RAW images in 4.265 seconds for a 7.97 fps rate calculation. An additional frame is captured .3 seconds after the buffer is filled and additional frames are then captured roughly every .6 seconds. Switch to compressed raw format and the buffer depth increases to about 91. Why would one choose the high speed drive mode over the highest speed drive? There is a reason that a "+" was used to describe the fastest mode vs. simply calling the 10 fps mode "HI" and the primary difference is in viewfinder blackout time. With the EVF (or LCD) showing the subject a higher percentage of the time, subjects are easier to track while shooting bursts at the slower frame rate. The difference is noticeable. While I could track subjects approaching straight toward the camera reasonably well in "HI+" mode, it was quite difficult to keep side-to-side moving subject in the frame. In the latter case, "HI" mode was the better choice. A performance-related consideration is that writing the full buffer to the card takes about 20.4 seconds with the referenced SDXC card. While you may not be capturing buffer-filling bursts most of the time, it is important to understand that writing to the card takes a noticeable amount of time and some camera settings are unavailable during the write operation. A (minor-for-most) memory card performance-related issue to mention is the memory card format time. Sony creates a database while formatting memory cards and the entire format process is long, taking about 10 seconds to format a 128 GB UHS-II SDXC card. While 10 seconds is not a terribly long timespan, it seems quite long when inserting a not-preformatted memory card when action is happening (and not in keeping with our impatient culture). You may want to format your Sony-destined memory cards during shoot preparation instead of during a shoot. Note that, as with the a7R III, the cards insert label-forward in the a7 III. Drag your mouse over the labels under the following image for a visual look at the "HI+" rate (captured with the a7R III). A short shutter lag is a very important camera attribute and this one's unpublished spec is extremely fast. However, with no sound when the front/first curtain electronic shutter is in use, it is hard to fully realize the responsiveness of this shutter. With the a9, I enabled the electronic shutter sound, but I tried in vain to find that feature on the a7R III and a7 III. Of course, a beep is not going to be heard in a loud environment anyway. It would be great if Sony could incorporate haptic feedback into the shutter release so that the precise moment of shutter actuation was realized. The click or other feedback response could not impart vibration into the camera, but ... it would be helpful to know the exact moment the shutter release was pressed far enough to take the picture. The a7 III's front curtain electronic shutter can be turned off, with viewfinder blackout time very noticeably increasing. With Silent Shooting enabled, this camera does not make any sound while capturing images. Complete silence is a hard sound to share on a website, so I'll trust that you can understand this camera's ability to be stealthy in that respect. Turn Silent Shooting mode off (electronic first curtain shutter still selected) and ... I have something to share with you. 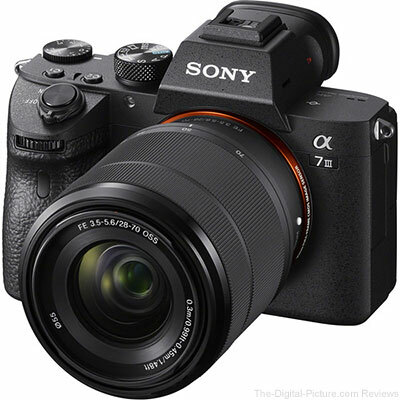 Following are links to MP3 sound files of the Sony a7 III in action. The a7 III's increased frame rate performance alone is going to be worth the upgrade from the a7 II for many. Similarly, the ability to shoot in complete silence is a huge value for quiet events such as weddings and when skittish wildlife are the subjects. Silent shooting mode requires a full electronic shutter that comes with both advantages and disadvantages. Let's start with the positives. With no mechanical shutter being used, there are no moving parts, shutter failure is not possible, there is no shutter vibration to be concerned with and, relevant to the just-finished discussion, the camera can be operated in absolutely silence, full stealth mode. Again, wildlife and event photographers should take careful note of that last benefit, but also remember that it becomes hard to know the precise shutter release timing. The a9 features no viewfinder blackout and one struggles to know when the pictures are being taken. The a7 III has a short blackout period, so it is easier to tell when images are captured, but it would still be nice to have better feedback in some form. The downsides of an electronic shutter are primarily related to the current-technology line-by-line reading of the imaging sensor. Fast side-to-side subject or camera movement can (and will) result in an angular-shifted image with vertically straight lines becoming noticeably slanted (with the camera in horizontal orientation). It is not hard to create an example showing this effect. 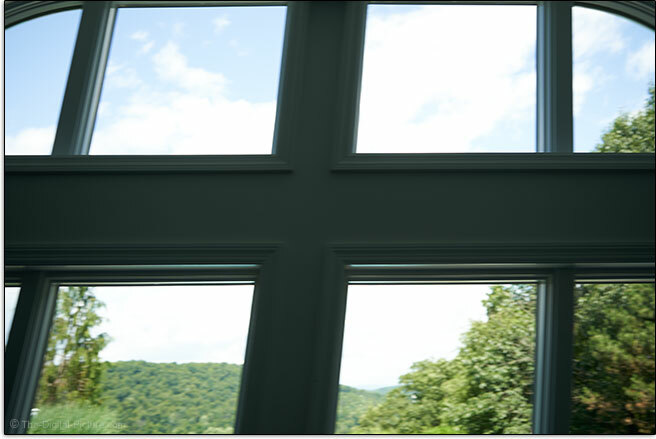 In the example below, the center-most windows should be (mostly) rectangular. While the horizontal lines, running in the direction I was panning the camera, remain horizontal, but the vertical lines are angled, revealing the line-by-line reading of the sensor. Needed to be understood is that the second curtain of a mechanical shutter chasing the first curtain can produce the same effect. However, the difference between mechanical shutter (with electronic first curtain shutter) and electronic shutter performance in this regard has historically been quite big and that is again what I see with the a7 III. Another electronic shutter issue to be aware of is that certain light pulsing can influence the results, potentially creating banding. I did not encounter this issue with the a9, a7R III or a7 III. Also be aware that the electronic shutter is not compatible with flash use. Regarding the a7 III's autofocus system, Sony states that it "...has 425 contrast AF points that work with a 693-point focal-plane phase-detection AF system inherited from the acclaimed a9 model." That Sony decided to employ the a9's impressive AF system in its entry-level, full-frame MILC raised more than a few eyebrows during the a7 III's announcement. Having the a9's AF system in a body that costs less than half as much adds greatly to the a7 III's allure. 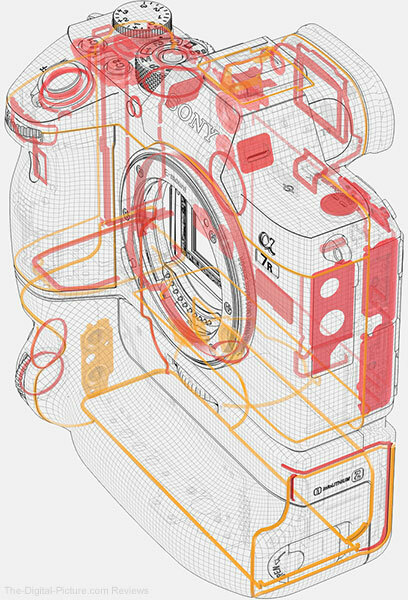 Notable in this illustration is that the available focus points cover a very significant portion of the frame – approximately 93% – and that is a very useful feature. There is also a 2x improvement theme going on here. Sony indicates that the a7 III's AF response is up to approx. 2x faster (under dim lighting conditions), AF tracking is said to be improved by approx. 2x and Eye AF (tracking a subject's eyes) has been added. I don't have an a7 II to compare, but the a7 III and a7R III focus with similar speed – I struggle to see any difference. Eye AF is a very useful feature and it works. The Sony a7 III's Focus Area options are Flexible Spot (S, M or L point size selectable), Expand Flexible Spot (uses focus points around the spot as a secondary priority area for focusing), Center, Zone (9 selectable large AF areas) and Wide (all points active). AF point/area selection can be done using the joystick (an immensely useful feature) or, if using the rear LCD for live view, touching the LCD will select the focus point, overriding the AF area to Flexible Spot until the cancel icon is tapped. This feature would be useful when the EVF was in use, but ... it is not enabled when the rear LCD is not being utilized. AF parameters can be further configured including Priority Set in AF-C (priority for AF vs shutter release in continuous focus), AF tracking sensitivity and orientation-sensitive AF point and area selection. A camera of course requires a lens and the lens plays an important role in autofocus performance. For proving out the a7 III's low light capabilities, I used the Sony FE 55mm f/1.8 ZA Lens. The a7 III is rated to focus in extremely low light levels (rated to EV -3 – 20 with an f/2 lens), light levels well below what my Sekonic Litemaster Pro L-478DR Light Meter is capable of reading. As usual, focus speed suffers in low light, but this camera achieves focus in near darkness. And, with the focus assist light enabled, darkness is not a problem within the light's range, which is decent. That the EVF shows an amplified signal coming from the imaging sensor makes this camera much easier to use in low light than optical viewfinder models. In AF-S (single shot mode), AF has been extremely accurate and I developed a very high level of trust in it. I use the small Flexible Spot AF most frequently in this mode and the camera very reliably focuses on what it is told to focus on. However, there is an exception to that glowing review. I seem to come across infrequent situations where the camera cannot lock focus. I was photographing a portrait of a couple standing in front of a waterfall using a tripod-mounted Sony FE 70-200mm f/4 G OSS Lens. About every other focus attempt would fail. I moved the AF point slightly and was eventually able to get a modestly better success rate. 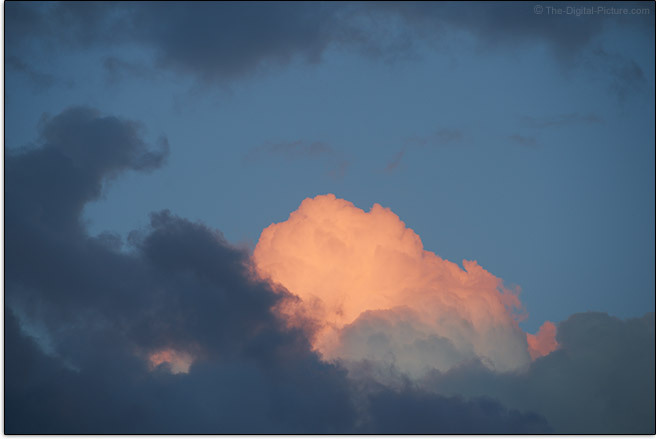 Another example of this issue was when photographing clouds. This camera would very frequently fail to focus on clouds, being very picky about where an AF point was positioned over the scene. The lens may be part of the issue, but ... I suspect the AF system bears most of the blame. While the camera drives focusing at a fast speed, the speed of AF-S single focus lock is somewhat slow. The camera always defocuses the lens prior to focusing. Even if the subject is already in focus, the lens is adjusted to a closer focus distance and then back to where auto focusing was initiated. That defocusing adds a slight delay and it is problematic in some situations when I need to focus and capture an image immediately, often due to a subject that was not still. Having never used the a7 II, I cannot attest to the III's 2x better performance, but its speed should be more than adequate for most situations. In AF-C continuous focus mode, the a7 III gives up the focus hunting practice and the result is faster focus acquisition. Again, performing especially impressively was the face recognition mode. With all AF points active, the camera would track a face around the screen as it approached with an even better accurate focus rate. As mentioned, this camera's AF system is configurable and it is impossible to test all possible scenarios and all possible AF settings. Certain is that the a7 III has benefitted from the a9's hand-me-down technologies. Note that 4K video capture at 30p is also available on the a7 III. However, unlike the a7R III, the a7 III has a 1.2x crop factor when capturing 4K at the higher framerate. The additional resolution captured in 4K recording is substantial. 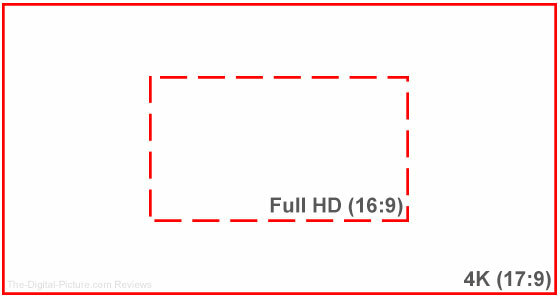 The illustration below demonstrates the difference between Full HD and 4K resolutions. Of course, creating 4K content is the primary benefit of purchasing a 4K-capable camera. 4K video offers more than 4x the resolution of Full HD, allowing for beautifully sharp and detail rich movies that will remain impressive on resolution-hungry devices. On my studio monitor, the difference is substantial. 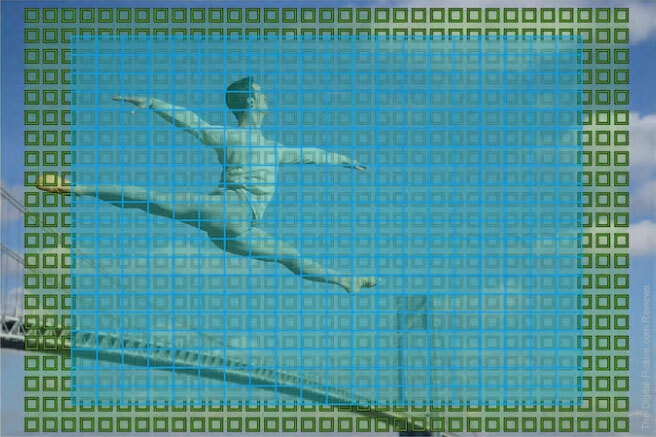 Various markers and masks can be displayed, with options such as gridlines and aspect ratio masks aiding in shot framing. 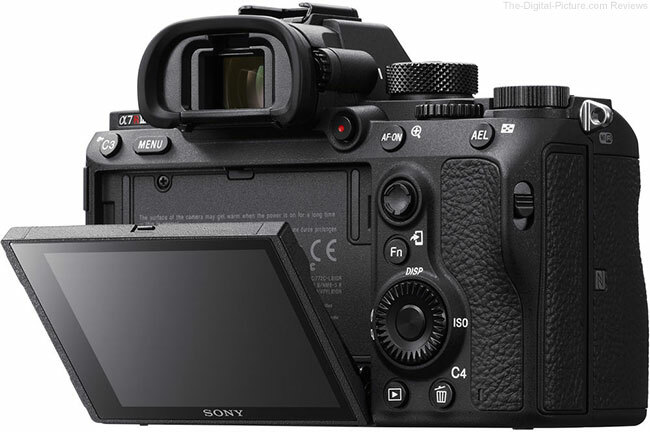 The a7 III can be set to record 4K video in-camera (via the memory card) and output the video to the microHDMI (to a compatible playback monitor or recorder), or alternately only output the video to the microHDMI. SteadyShot (IBIS) is available for enabling more stable video to be recorded, increasing video production quality. The Sony a7 III performs nicely from an autofocus perspective in video mode. Focus distance transitions happen accurately and at a nice rate (not too fast, not too slow) at the default settings. Especially nice is being able to touch the LCD to change AF points during video recording. However, there seems to be slightly too much lag time between the focus tap and the focus change. The a7 III's video quality is outstanding. I used this camera to record my daughter's wedding from a fixed location. The camera proved to be an excellent choice. The high quality video capabilities of the a7 III adds strongly to the overall value of this small, budget-friendly full-frame camera model. The a7 III gets the same 1200-zone metering system found in the a7R III and a9. Also nice is that "When the Focus Area parameter is set to Flexible Spot or Expand Flexible Spot the metering spot location can be linked to the focus area so that the optimum metering point is maintained automatically. Two spot sizes are available to match a wide range of subjects." I have found the a7 III and the other Sony MILCs I've used to deliver good image brightness when using the auto exposure feature. For the images shared above, a 70mm focal length lens was used with a 1/500 second shutter speed, a realistic setting for indoor action sports (long exposures avoid the flicker issue). The subject of these images was a white wall and every other frame from a 10 fps burst was selected. Both brightness and white balance are affected by the dim cycle of the lighting and correcting even one of these affected images is very challenging and time consuming. I have some fluorescent lights in my basement that have proven to be reliable test subjects for my Canon cameras and figured that they would serve equally well for testing Sony cameras. Unfortunately, the image above shows the results with the anti-flicker feature enabled. Those results were from the a7R III, but the a7 III test results showed the same. I tried "HI" and single frame shooting with no difference. Apparently my (very typical) fluorescent tubes are not compatible or I haven't figured out some nuance to make this feature work (it shouldn't be that hard). The a7 III can detect (only) 100 Hz and 120 Hz flicker. Sony notes that continuous shooting speed may decrease when anti-flicker is enabled and this makes sense as the camera pauses to miss the dim cycle of the lights (Canon makes the same claim with their technology). Anti-flicker cannot be enabled during silent shooting. Quickly put the a7 III to your eye and, via eye-detection, the camera is ready for you, nearly instantly switching the image display from the rear LCD to the EVF, ready for a quick capture. With an eye at the viewfinder, you will notice how large the EVF is. While the size of the camera is quite small, the size of the viewfinder is not. With one eye in the viewfinder of the a7 III and the other eye simultaneously at the top professional grade Canon EOS 1D X Mark II viewfinder, it is readily apparent that the a7 III's viewfinder image is modestly larger than even this highly-respected 1-Series viewfinder. 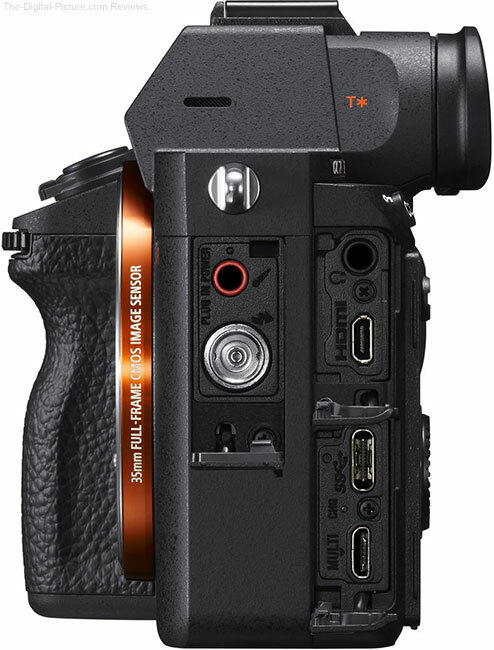 The a7 III features a 0.5" (1.3cm) 2.36m-dot Quad-VGA OLED Tru-Finder EVF which is the same size as the EVFs found in the a7R III and a9, but those cameras have a higher resolution, 3.686m-dot display. That difference in resolution is noticeable, and while the a7 III OVF is quite nice, it shows pixelation much more readily than the other two camera models. Brightness is important in part because a brighter EVF can better show contrast in a scene, competing closer to optical viewfinders in this regard. Improvements continue to be made in this regard, though more are needed. For example, I was chasing rainbows immediately after a storm had passed. The rainbow was easily visible, but I struggled to see it well enough in the OVF to properly adjust a circular polarizer filter to maximize the rainbow's brilliance. I will not go into a full discussion of the advantages and disadvantages of an EVF here, but the a7 III's EVF should work well for most needs. While the a7 III's blackout period during image capture has not been eliminated, as previously mentioned, it is rather short. As with other Sony MILCs, DOF preview is optionally automatic (the default), with the background blur change seen as the aperture setting is changed. Those familiar with the Sony a7 II (and other similar Sony cameras) will readily familiarize themselves with the a7 III. I did not evaluate the a7 II and you won't find its comparison image below, but I'll draw attention to the changes which occurred between the models as well outline how the a7 III compares to the a7R III and a9. Those familiar with the a7R III are going to have to look carefully to distinguish between the two cameras. Those familiar with Canon and Nikon DSLRs should be ready for a solid learning curve. 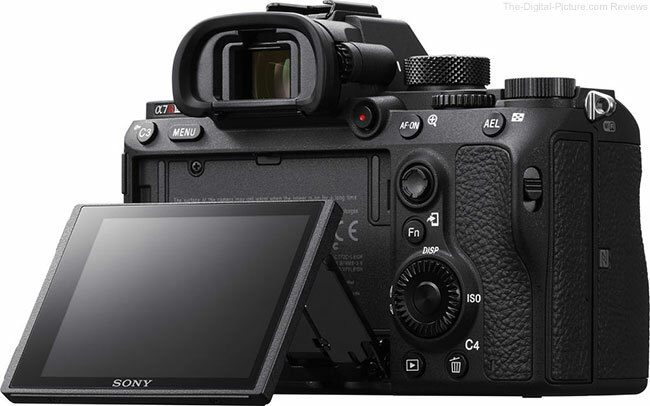 While not as loaded with dials and buttons as the a9, the a7 III provides good control at your fingertips and, with 4 custom buttons, plenty of customization capability is provided. That is of course good as long as you become familiar enough with the controls to remember what you've programmed them for. While the Sony a7 III (and similar models) is a bit clunky in design with plenty of sharp edges, a seasoned user is going to find it ready to get the job done. The Sony a7 III received a noticeably-updated rear design with one particularly-substantial upgrade included. 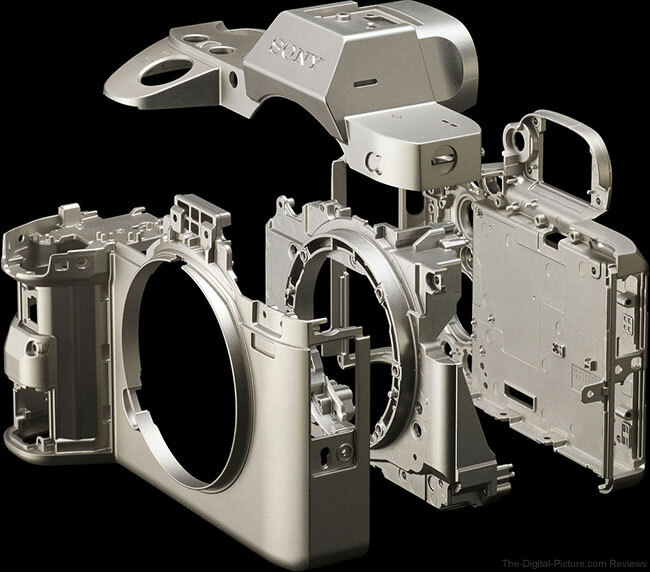 To compare the Sony a7 III with many more camera models, use the site's camera body comparison tool. 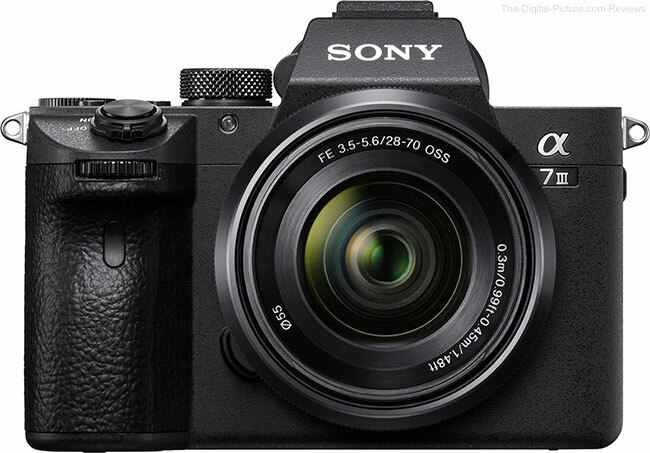 For control and features, Sony lifted the a7R III rear design for re-use on the a7 III. That was a good move. The LCD monitor continues to be the dominant back-of-the-camera feature in today's cameras and will continue to be such into the foreseeable future. This LCD is the same size as featured on the a9 and a7R III, a tilt type 2.95" TFT. However, just like the EVF, the a7 III gets a lower resolution LCD model compared to Sony's other contemporary full-frame models, with this one weighing in at 921,600 dots instead of 1,440,000 dots. I can see the difference, but this difference bothers me considerably less than the EVF difference. The tilt adjustment, ranging from approx. 107 degrees up to approx. 41 degrees down, is a very attractive feature, especially to those of us still using fixed LCDs (the benefit for fixed LCDs is their overall durability). 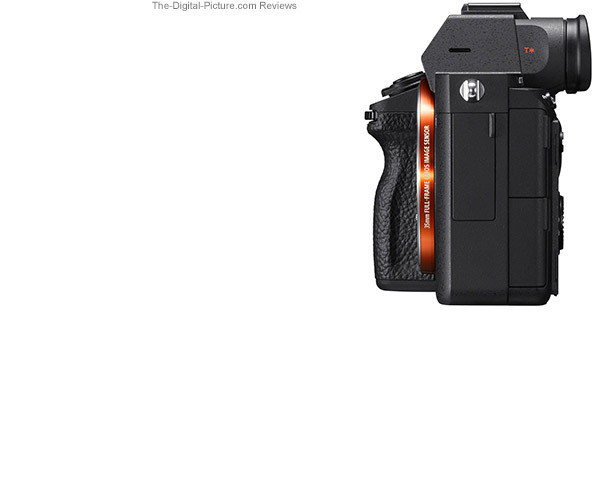 Note that the a7R III is shown in the above and below images. I would like the LCD surface to be less-reflective for easier use under bright conditions, but that reservation is not limited to this model in particular. While this LCD can be used for touch AF point selection when the rear LCD is active, that function is the limit of its touch capabilities. I'll take a small tangent to mention Sony's menu system (that you will often view it on the LCD is the tie-in I claim here). I'm both spoiled and acclimated to Canon's excellent, logical menu systems, but I feel lost in Sony's seemingly overly-difficult menu system structure that includes 32 subtabs under the 5 main tabs. That a customizable "My Menu", missing on the a7 II, is provided and customizable for up to 30 of your most-used functions is alone a huge improvement, making a substantial difference in ease of use. For example, I no longer have to navigate to the Setup Menu, sub-tab 5 just to find the constantly-used "Format" option. At the bottom right of the camera back, we see the playback and delete/C4 (Custom Button 4) buttons retaining their a7 II locations. Moving up, we find the control wheel that is now raised and slightly enlarged, both very positive features/changes, though the periphery of this dial could be slightly less beveled to for easier engagement with the thumb. The control wheel icons on the a7 III remain unchanged from the a7 II. Replacing the switch above the programmable function button, providing quick access to 12 common functions, is the new multi-selector, a joystick. The control wheel acts as a 4-way controller and while it seems that it should have 8-way functionality, the new multi-selector is an 8-way controller and by assuming much of the other controller's functionality, diminishes the 4-way issue. The multi-selector is used for, and is especially useful for, AF point selection. If photographing a quickly-moving subject such as wildlife, the joystick is a game-changer and easily makes the a7 II-to-III upgrade worthwhile. While the new multi-selector works fine and it is a very welcomed addition to this camera, I would like it to have a slightly improved, more-significant/positive feedback click. It is especially challenging to use this controller with gloves on. A pair of new buttons, AF-On and AEL (Auto Exposure Lock), functions displaced by the multi-selector joystick, take up residence above the multi-selector. The C3 (Custom Button 3) gets shifted from the right side of the viewfinder, moving to the left of the menu button on the top-left of the camera back. Showing serious attention to video needs is Sony's repositioned movie start/stop button, located just to the right of the viewfinder where it is easily thumb-accessible. The top of the a7 III is practically identical to the a7R III and similar to the a9 with the big exception being the missing stacked dial on the left side of the camera. The a9's stacked dials provide easy accessibility and visual confirmation to commonly used settings and I would have welcomed them on the a7 III and a7R III. Instead, the a7 III simply has a speaker in the otherwise unused space. Skipping over the viewfinder and hot shoe, we find the ultra-common mode dial which contains all of the notable differences between the a7 III and a7R III. The a7 III's dial is slightly smaller than the a7R III's and does not include the R model's mode dial lock release button in the center. Also gone missing from the mode dial is the R's C3 custom mode setting. I use custom modes at least as much as any other modes combined, with my most used camera settings for various situations ready at the turn of the dial. It seems like it would have been more efficient to simply re-use the a7R III's dial than to use a new dial with a missing setting (probably done for product segmentation). Note that the a7 III is also capable of saving and reading camera settings to/from a memory card. Looking at the modes provided, Sony neophytes probably need to be enlightened regarding the S&O acronym. That is "S"low and "Q"uick, referring to Slow and Quick Motion movies previously mentioned. Just counter-clockwise to the S&O mode is the normal movie mode. A pair of programmable custom buttons are within convenient reach of the index finger on top of the camera and the shutter release, surrounded by the power switch, is located to the front. The exposure control dial is also easily accessible (to the thumb) with easy visual confirmation of the current setting. This dial is positioned closer to the side of the camera, making it more exposed and easier to turn. Less obvious is another dial, referred to as the rear dial, located rearward between the mode dial and exposure compensation dial. On the a7R III, this dial is exposed by 3mm more than in the a7R II, making it also considerably easier to use. The a7 III's rear dial is, as you might have noticed, identical to the a7R III's. Once acclimated to the control positioning and feature locations, this camera is quite easy to use and a quality feel abounds, including dials that click reassuringly into positions. 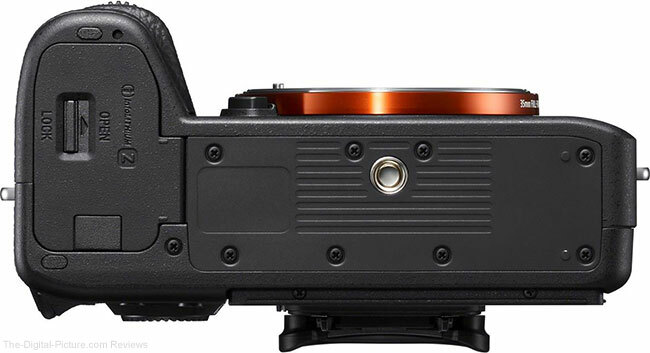 Unfortunately, Sony didn't release the standard-until-now side of the camera with port doors open product image. So, if you'd like to see what this view of the camera looks like with the port doors open, view the a7R III imagine and visualize an empty space where the flash sync port is. From the top left and continuing clockwise, there is a mic port, a headphone port, an HDMI (micro) port, a SuperSpeed USB (USB 3.1 Gen 1) and USB Type-C Terminal. Again, the flash sync port found just below the mic port on the a7R III is absent on the a7 III. Just like the a9 and a7R III, the right side of the camera features the NFC (Near Field Communication) touch point and a pair of memory card slots reside under the spring-loaded door released by the also-spring-loaded switch to the left. Note that the a7 II/a7R II and a7 III/a7R III/a9 use opposite memory card orientations. The a7 III is brand label-forward oriented, opposite of my preference as label-rearward allows me to more-quickly identify the card being inserted. The shape of the a7 III and a9/a7R III are so similar that the same Kirk L-bracket can be used interchangeably. One of the big attractions to the Sony MILCs is their small size and light weight. Small is great in many respects, but too small has a real potential downside in regards to the grip of a frequently-used camera. When you want to have full control over something, you grasp it with your entire hand. You don't hold a baseball bat, tennis racket or golf club with just your fingertips. The same is true for a camera grip. While I'm not swinging my camera in the same way as those sporting implements are used, I still want total control over my camera and an attached lens. The a7 III grip, like the a7R III grip, is modestly too small for my medium-sized hands. When grasping the camera in the manner needed to control a sizable lens, the first joint on two of my fingers presses into the lens body where it flares outward. With neither my finger joint nor the lens being cushioned, a strong discomfort is felt. My brother picked up the identically sized a7R III with an FE 70-200 f/2.8 lens attached and immediately dismissed the idea of that camera being his someday. Note that the smaller FE lenses are much better in this regard. 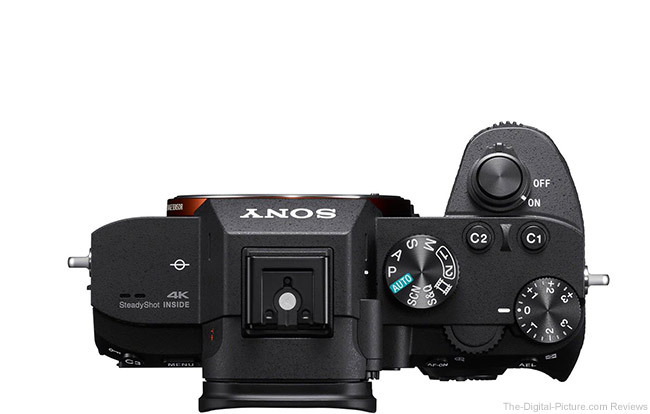 The a9 is shown above and the experience is the same with the a7 III and a7R III. While having a small camera is good for compactness reasons, a model being handheld with frequency needs a larger grip. Acquisition of the Sony VG-C3EM vertical grip should strongly be considered for this camera. This is the same grip used by the a9 and a7R III. The vertical grip provides much-improved handling (it minimally gives my pinky a role) and also permits two batteries to be used, doubling the number of shots that can be captured before battery replacement. Grip features include a vertical shutter release, rear control dial and multi-selector. While this camera is much easier to operate in vertical orientation with the grip installed, the grip's rear dial falls under the pad of my thumb. This is not terribly uncomfortable, but it is not optimal either. The biggest downside to the grip, aside from the purchase cost, is the size and weight it adds to the camera. Still, even with the grip installed, the a7 III remains smaller and lighter than the Canon and Nikon DSLR equivalents. The VG-C3EM, shown on the a9 above, is constructed of magnesium alloy with dust and moisture resistance matching the a7 III. It is well-built and well-matched. You don't have to use it all of the time, but if it is in your kit, it will be ready for when you want it. Just need to add room for an extra finger on the grip? Did you know that Sony has that need covered? The Sony GP-X1EM Grip Extension provides that. Built on a magnesium alloy frame, the Sony a7 III has a high quality, solid feel to it – similar to the a9 and a7R III. In general, the buttons, dials and switches have nice haptic feedback, though the multi-selector leaves room for improvement. While I haven't seen the level of weather-sealing received in this camera defined, it indeed has this feature as illustrated by the Sony images below (same as a7R III illustrated below). I didn't stress test the a7 III for wetness survivability (my insurance company has an aversion to me discovering that failure point), but understand that the bottom of this camera is reportedly not adequately sealed. 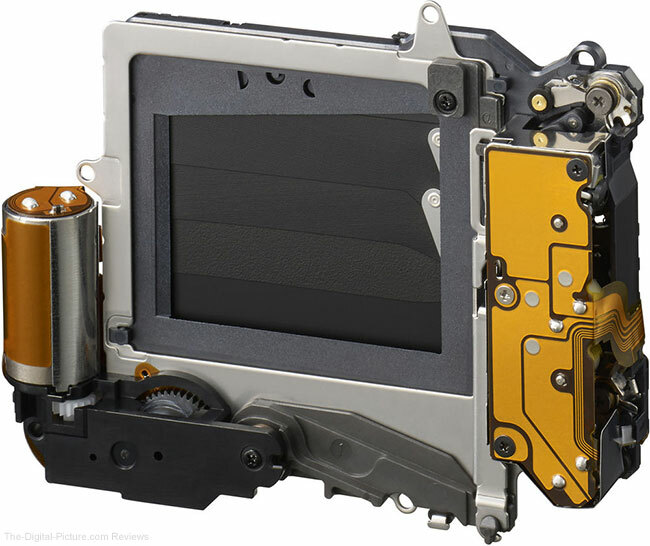 Another durability concern for cameras is the mechanical shutter assembly. Unfortunately, Sony has not published a shutter durability rating for the a7 III. New with the a7R III was a rating function, allowing a 1-5 star value to be attributed to captured still images and this rating feature has also been incorporated in the a7 III. Another interesting new feature available during playback is grouping display, with a single thumbnail image shown to represent a group of images captured in burst. All images in the burst can be locked or deleted as a group. One of the major drawbacks of the Sony a7 II is its very short battery life with an inadequate 250-shot rating using the NP-FW50 battery pack. Even a short duration a7 II shoot can quickly surpass the single battery life rating and require multiple batteries. Addressing that shortcoming is the new Sony NP-FZ100 battery pack with about 2.2x capacity of the NP-FW50. In the a7 III, the NP-FZ100 is rated for approx. 610 shots using the viewfinder or 710 shots using the LCD monitor. While those are still only modest battery life ratings, the difference seems much greater and I have been able to accomplish all of my daily needs with a single battery (I didn't shoot an all-day wedding or similar). Of course, the shooting style being used can make a dramatic difference in the number of shots obtained from a single charge. For example, the similar-battery-life-rated a9 captured 6,125 images in a 3 hour timespan at a sprint car race with 34% battery life remaining in the single battery I had with me. I didn't track battery usage while reviewing the a7 III, but even a day at Ricketts Glen state park didn't put a huge dent on the battery life. The battery door is spring-loaded, but the switch is not. Slightly annoying is that it must be manually slid into the locked position after closing the door. Unlike the NP-FW50, the NP-FZ100 is keyed to be inserted in only two orientations vs. four. Unfortunately, it still fully inserts backwards (without locking into place). Fortunately, the battery contacts make the remaining mis-orientation less logical to try. Nice is that this battery can be charged in-camera via the USB port. A USB wall adapter with a 2' (.6m) USB cable is provided, but, unfortunately, a battery charger is not. The standard battery charger is optionally available and if I planned to use the a7 III regularly, I would have to get one. With what comes in the box, the a7 III requires a USB power source within 2' (.6m) of a comfortable location to place the camera (or a longer USB cable). However, with the USB port cover opening downward and the USB cable plugged in, the port cover can only be positioned toward the bottom of the camera and the camera can no longer sit on its base. Options remaining are to balance the camera on the open plastic port door or facing front-down, rear-down, upside-down, or grip-down. While this is not a huge deal, it makes a very frequent task a bit awkward. When deciding on a camera to purchase, the entire accessory system available to that camera should be considered. If your needs are light, a few good lenses may be completely adequate. Professionals with more complicated needs are not as easy to satisfy. While Sony trails Canon and Nikon in this regard, Sony has more than the basics covered and has added considerably to their lens lineup recently. What is the best lens for the Sony a7 III? The lens is of course one of the required accessories and most will find the Sony FE 24-70mm f/2.8 GM Lens to be the best general purpose lens available for the a7 III. For longer focal length needs often encountered by professionals, the Sony FE 70-200mm f/2.8 GM OSS Lens is a great choice and the Sony FE 16-35mm f/2.8 GM Lens is a great option for the wide angle needs. 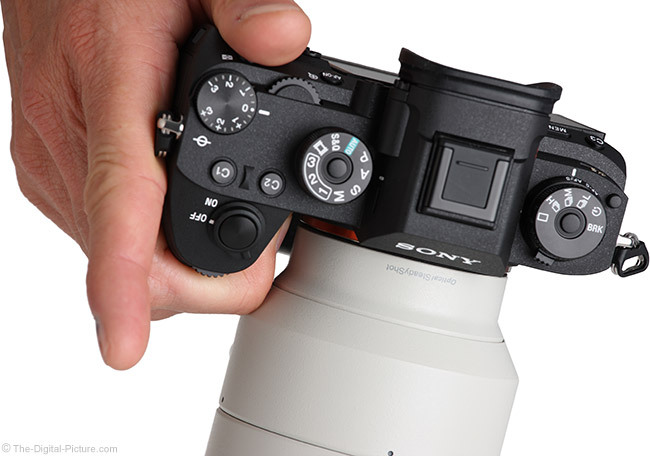 Watch our growing Sony Lens Reviews page for more good options. At first glance, the a7 III's low price appears very competitive compared to the Canon EOS 6D Mark II and Nikon D750. In fact, at review time, all three bodies share the same body-only MSRP without rebates factored into the equation. From a features-to-price standpoint, the a7 III represents an excellent value. But, the entire kit price, especially including lens costs, must be evaluated. Be sure to price out an overall kit before making a price-based decision. Of course, the Sony a7 III and the best lenses available for it are good enough to stand on their own regardless of the price, but when the camera's wide array of high-end specs are taken into consideration, it's obvious that this body represents one of the best values in the MILC market. This camera has an extremely deep feature set and I can't cover everything this camera can do in a reasonably-concise review. Communications features alone include USB-C, Wi-Fi, NFC and Bluetooth connectivity. 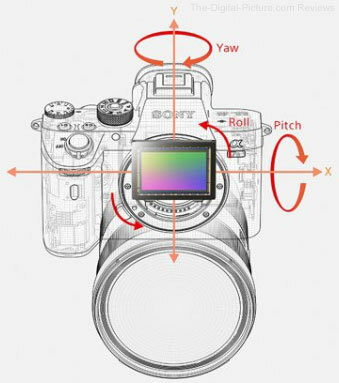 The Sony a7 III owner's manual (linked to at the top of this page) provides a deeper look into the full capabilities of this camera, though at only 100 pages, it is not the most in-depth camera manual available. Read the manual, go use your camera, repeat. The Sony a7 III used for this review was acquired online/retail. The most significant difference for most photographers resides at the top of the list. The difference between 24.2MP and 42.4 is significant; then again, so is the price gap between the two cameras. The OVF difference is another a7R III that I especially appreciate. 1/8000 sec. max shutter speed vs. 1/4000 sec. With the two cameras sitting at a similar (or equal) price point, any specific feature could be prove to be a deciding factor between them. If you are already heavily invested in the Canon system, the a7 III's advantages may not prove worth the significant resources required to switch systems. However, if starting from a clean (or relatively clean) slate, the a7 III's benefits are certainly appealing. The first Sony camera I owned was the a7R II. After reviewing the Sony a9, I was left wanting. The upgraded features made the a9 far more usable and when the Sony a7R III hit the review desk, that upgrade decision was not hard to make. Now the a7 III has shown up with many of the same features but at an entry-level full frame camera price tag. And, the sensor in this camera has the excellent low noise, high dynamic range features that Sony is renowned for. As a package, the a7 III makes a very compelling case to join your kit. I especially like how Sony is using standardized designs across its models, taking advantage of the efficiencies that such brings. While there are features I would like to see changed, including a re-worked grip and improved menu system, this camera's design has matured a great deal and it is easily ready to be your daily use model. If the a7R III is not in your budget, this camera is an easy choice.